• God's plan of redemption for Israel and Jerusalem is comprised of 70 weeks (Dan. 9:24-27). • Israel's greatest ruler, King David, died at the age of 70 (2 Sam. 5:4). Notice that both watershed events related to Israel's restoration to the Land--the rebirth of the Nation in 1948 and the restoration of its capital in 1967--are preceded by a seminal event 70 years earlier. The odds against this occurring by chance are astronomical, suggesting divine orchestration. While the events of 1948 and 1967 were vital to God's plan to redeem the Jews and the Holy City, they did not represent the endpoint. When we extend the pattern forward 70 years from 1948, we arrive at the biblical year spanning 2018-19. "This will be my third visit to you. 'Every matter must be established by the testimony of two or three witnesses'" (2 Cor. 13:1). "Know and understand this: From the issuing of the decree to restore and rebuild Jerusalem, until the Messiah, the Prince, there will be seven weeks and sixty two weeks" (Dan. 9:25). The modern-day rebuilding of Jerusalem began in 1969. When we add Daniel's seven weeks, or 49 years, to this date we arrive at 2018-19. What are the odds that Israel's prophetic 70th year would correspond to the 49th year since the rebuilding of Jerusalem began? If the 70/49 convergence in 2018-19 isn't uncanny enough, here's another: The "seven weeks and sixty-two weeks" in Daniel's prophecy add up to 483 years. When we add 483 years to the time that an earlier decree to rebuild Jerusalem's walls was issued in 1535 AD by the Ottoman Emperor Suleiman, we, again, arrive at 2018-19. Thus, we have three key eschatological timelines pointing to 2018-19. But there's more. 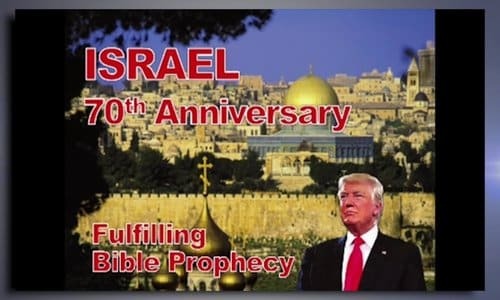 Israel's 70th year also corresponds to the calculated 6,000th year from Creation, the time that the seventh thousand-year (millennial) day known as the "Day of the Lord" begins. "Brothers and sisters, we do not want you to be uninformed about those who sleep in death, so that you do not grieve like the rest of mankind .... For the Lord himself will come down from heaven, with a loud command ... and the dead in Christ will rise first. After that, we who are still alive and are left will be caught up together with them in the clouds to meet the Lord in the air .... Now, brothers and sisters, about times and dates [of this event] we do not need to write to you, for you know very well that the day of the Lord will come like a thief in the night. While people are saying, 'Peace and safety,' destruction will come on them suddenly, as labor pains on a pregnant woman, and they will not escape" (1 Thess. 4:13, 16, 17; 5:1-3). While there have been a number of peace plans proposed since the restoration of Jerusalem in 1967, the Deal of the Century is the only one to coincide with a convergence of key eschatological timelines, begging the question: if the talk of peace and safety in 2018-19 isn't that which Paul was alluding to, then what could he have been alluding to, and how will we recognize it when it occurs? Assuming that Paul's peace-and-safety sign is manifesting before our eyes, consider the ominous scenario: Daniel's weeks prophecy assigns a period of 70 weeks (490 years) to redeem the Jews and Jerusalem. In 2018-19, exactly 70 years after the Jews' return to the Land, and 49 years after Jerusalem was restored as its capital, a peace plan has been drafted that purportedly aims to divide the Holy City. God's plan calls for the restoration of the Holy City, while the world's plan is to divide it. Dividing Jerusalem is prohibited because it belongs to the One who will reign there during the millennium (Jer. 3:17). The Lord has been patient for decades as Israel has tried to secure peace by giving away land. A plan that aims to divide the Land around the 6,000th year from creation, however--the time that Messiah the Prince is set to take possession--explains why destruction will come "suddenly" upon those saying peace and safety (1 Thess. 5:3). Ancient Israel was exiled physically from the Land for 70 years. Is it possible that modern Israel's 70 years represent a time of spiritual exile in which the Jews are present in the Land yet separated from the heart of Messiah? The physical exile preceding the spiritual makes sense in light of Paul's teaching that the physical man, Adam, precedes the spiritual, Jesus (1 Cor. 15:45-49). When Israel's 70 years of exile were complete, God judged Babylon (Jer. 29:12). Could the completion of modern-day Israel's 70th year mark the beginning of judgment for "spiritual Babylon," i.e. the world? 2018-19 marks 80 years since the beginning of the seven-year Holocaust period (1938-45). Could 2018-19 also mark the beginning of the ultimate time of Jacob's Trouble? History records that during the Holocaust an estimated two thirds of the Jewish population of Europe was systematically murdered. Similarly, Zechariah says that two thirds of Israel will perish during the Tribulation: "In all the land, declares the LORD, 'two-thirds will be cut off and perish, but a third will be left in it. This third I will bring through the fire; I will refine them like silver and test them like gold'" (Zech. 13:8, 9). It's significant that the numbers 71 through 80 do not typify restoration or an endpoint in any comparable way in Scripture. Israel's 70th year, ending spring 2019, marks the convergence of four prophetic timespans and the drafting of the most anticipated Middle East peace plan in half a century. If this once-in-history convergence is God's way of declaring the season of His return, the world may soon see the Rapture and the beginning of the Tribulation week. In this scenario, the Church's redemption occurs "seven sevens" after Jerusalem's rebuilding began, while Israel's redemption occurs after "seventy sevens," at the end of Daniel's 70th week. The dividing line that separates the Church Age from the time of Jacob's Trouble is Israel's 70th year. Notice that in each case multiples of God's perfect number "7" signify ultimate perfection and completion. Having put forth a scenario, it goes without saying that we cannot set a time limit on Jesus' return. No man knows the day, and Scripture is clear that our prophetic range of vision is limited on this side of the last trump (1 Cor. 13:13; Matt. 24:36-44). On the other hand, believers should understand that nowhere in the Bible is speculation about the year or season of the Rapture discouraged. In fact, believers are encouraged to study the clues, to recognize the season, and be watching when the Lord returns (Heb. 10:25; Luke 12:37; 21:28; Ezek. 33:6). This is why the numbers and timelines are included in Scripture: This is why Daniel provides the countdowns of "weeks" to Messiah (9:25). This is why Jesus links the time of His return to the rebirth of Israel and a definite (generation) timespan (Matt. 24:32-34; Ps. 90:10). This is why Scripture is brimming with typologies like the 70 years in Babylon, which commentators agree is a picture of humanity's time of separation or exile in the fallen world. "You will be in Babylon for seventy years. But then I will come and do for you all the good things I have promised, and I will bring you home" (Jer. 29:10). Today, as the end of Israel's 70th year draws near, many are coming to understand by the prophecies that our time of liberation is at hand. Like Daniel, we're not privy to the day or hour, but we know that it's soon. • The wars fought in 1948 and 1967 (the War of Independence and the Six Day War) were accompanied by a host of miraculous events that tipped the scales of victory in Israel's favor. • The numbers 19 and 48 add up to 67, which is the year that Israel's capital, Jerusalem, was restored. • Gold is heated to exactly 1,948 degrees (1948) Fahrenheit during the refining process. Scripture compares Israel's deliverance during Jacob's trouble to the refining and purification process of precious metal (Zech. 13:9). • During Israel's 70th anniversary, a comet discovered in 1948 made its closest flyby since that time. On the day of optimal viewing, the comet passed within a few degrees of the star cluster Pleiades, which is said to be a heavenly representation of the Church. • 1948 + 70 years = 2018-19. 2018-19 marks 70 jubilees from the time of the Exodus (circa 1500 BC), when Israel was called out as a Nation. Thus, 2018-19 marks 70 jubilees since Israel's original birth and 70 years since the nation was born a second time. Some put the Exodus at 1522 BC, which means the Jews entered the land of Canaan circa 1482 BC. If this calculation is correct, as of 2018-19 it has been exactly 3,500 years, or 70 jubilees, since the Jews first entered the Promised Land. "Jerusalem Restoration On High Priority List"
"JERUSALEM -- One of the most dramatic restoration projects in the history of cities is forging ahead in the ancient walled city of Jerusalem. The reconstruction of the Jewish quarter of the Old city, lost to the Jews in the 1948 war after centuries of occupancy, is one of the high priority projects of the Israeli government." 5). The Holocaust (1938-45) is a type of Jacob's Trouble, or Tribulation: The first major actions against the Jews (Krystallnacht, decrees banning business and property ownership, and ordinances banning attendance at public schools) began in Germany in 1938. In 1939 Germany invaded Poland (considered to be the start of World War II) and began opening forced labor camps and ghettos to segregate and confine Jews. Major killing operations began in 1941 and peaked between 1942 and 1945 when World War II ended. Interestingly, from the end of the Holocaust on May 9, 1945 (V-Day) to the anniversary of Israel's rebirth in 2019 (Iyyar 5) is exactly 888 months. 6). The biblical year ends Nisan 1 (April 6-7) in 2019. Counting from Israel's May 14, 1948 birthday, the 70th year ends May 14 (Gregorian) or May 9-10 (Hebrew) in 2019. • In both Daniel and Matthew, "seventy sevens," or 490, is the number linked to the ultimate forgiveness of sin (Dan. 9:24-27; Matt. 18:21, 22). Originally published at Season of Return Ministries - reposted with permission.